Becoming a dad can be a shock. No one prepares you for the changes- all around. Just like becoming a new mama (but in a wholly different way), bringing a baby into the world takes you on a wild ride through the portal of life. To see your baby born is a miracle and most men discover an incredible new respect for their partner. To actually witness what the body is capable of and the strength a woman demonstrates will humble the toughest man. But growing and birthing a baby puts the body through a certain amount of trauma or disturbance, and then there’s the breastfeeding and sleep deprivation. Your partner needs time to heal and rest her amazing birthing body. Your job at this time is really important. Although it can seem as if everything is about the baby, you are the pillar of strength your lady is depending on. Support your partner and be present. Its also so important for you to bond with your baby so make sure you make time to take the baby for walks, get to know your baby and give your partner a break so she can have some time to herself, even if it is just to have a shower! Becoming a parent often brings up undealt with emotions for people, so be prepared for that to happen for both of you. Parenting is the single most demanding role that you will ever experience. It requires a level of selflessness that for many hasn’t been required before. It can also bring to the surface familial patterns that you don’t want to continue with your new family. It can be a challenging time that unfolds but it is an amazing opportunity to let go of patterns or family dramas that don’t serve us. The emotional shift that takes place for some men around being responsible for another life can be confronting also and it can help to have realistic expectations and a good support network around you. When preparing for the birth fathers can take on the responsibility of setting up the pool and birthing space. 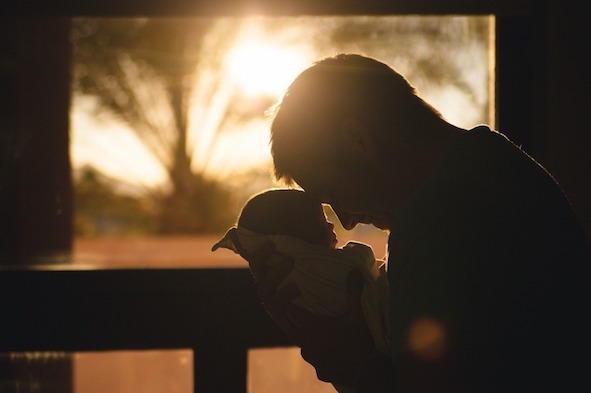 This practical role in assisting toward the birth is something a lot of dads get immense satisfaction from as they are supporting their partners on a useful level that is greatly needed. Do whatever you can to get you all through the first month or two while you adapt as a family and your partner physically heals. Keep her well fed, as she is most likely breastfeeding and giving most of her nutrients to the baby, she can easily get depleted, especially if she is still bleeding. Plenty of water in arms reach is important too as hydration is key when healing and making breast milk for the baby. Basic needs such as water, the bathroom and sleep are not always met when you are attending to a new baby 24/7. Be agreeable and go with the flow. Being supportive while your partner’s body and hormones adjust to post pregnancy and motherhood is one of the best gifts you can give. Post-natal depression is all too common for many new mums. She may say things she doesn’t mean or even understand in retrospect. Try and understand hormonal swings and sleep deprivation can be a dangerous cocktail. Be patient and communicate, ask what you can do and find ways to bond with your baby. Work as a team, you both need mental health time so work out a schedule or at least a general plan of giving each other a break to go and do something for yourselves or if possible together. Remember there is no rule book, we are all just winging it – You Got This! Share your thoughts and ideas directly in the comments below, we would love to hear from some other Dads about their experiences.